Having promptly exhausted every existing Snake-Eyes costume and quite a few repaints thereof, Hasbro needed a new way to milk their favorite cash cow. The solution? Highly specific one-shot outfits! Snake-Eyes is proficient in 12 different unarmed fighting systems (Karate, Kung-Fu, Jujitsu) and is highly skilled in the use of edged weapons. Has received extensive training in mountaineering, underwater demolitions, jungle, desert and arcitc survival; and holistic medicine. Qualified expert: all NATO and Warsaw Pact small arms. His expertise with arctic conditions came in handy when a team was sent to find out what happened to an Arctic research station. His ingenuity helped the team survive several encounters with the wily yet honorable Eskimo operative Kwinn and recover a fear-generating frequency modulator. That filecard info (along with the figure's distinct sculpt) peg this as being based on issue #2 of the Marvel comic. 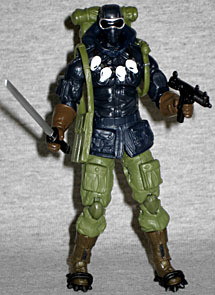 Hasbro actually tried to make a Snake-Eyes based on that comic before, but it was such a half-assed effort that this might as well be the first try. 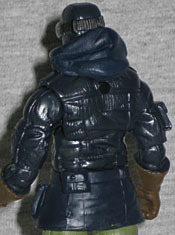 The only re-used portion of Snake-Eyes' sculpt is his head, taken from the TFAC box set. Though the "medieval visor" version of SE is the character's coolest look, the goggles and ski mask work perfectly for his arctic adventure. The mask is navy blue instead of black, but that isn't some cheap effort to duplicate the comicbook coloring: they actually chose to have him wearing dark blue. 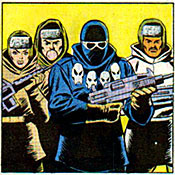 Obviously this Snake-Eyes is more about the "commando" than the "ninja" side of his background, because there's no way he's going to blend into the snowy tundra dressed like this. He's wearing a hooded parka with large pockets on the front and smaller pouches on the belt, chest and right arm. He has heavy brown gloves, insulated brown boots and thick green pants. The uniform is plain enough that any Joe could wear this and not look out of place. One feature that definitely pegs this as being solely Snake-Eyes is the necklace he's wearing: a string with four weasel skulls, the necklace was a gift from Kwinn the Eskimo, possibly the only comicbook character ever named after a Bob Dylan song. The necklace is a separate piece, which runs under the hood and loops over the figure's neck. He's also wearing green web gear with a grenade on one side and three long pouches on the other. Snake-Eyes' body may be new, but the articulation is as good as ever: balljointed head, shoulders, elbows, torso, hips and ankles, swivel gloves, and double-hinged knees. The ankles are a bit loose, but not so much that he can't stand on his own or hold some dynamic poses. His accessories include the typical sword and uzi, as well as some new pieces: a big green backpack, and a pair of black crampons. The spiked footwear can be slipped onto the figure's feet, and have their own holes to accommodate the display stand pegs. There are even two pegs on the backpack where the crampons can hang when they're not in use. 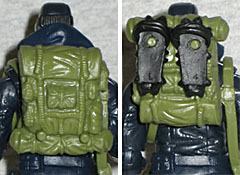 The backpack is complex and detailed well, but there is a problem: it doesn't fit properly on the figure. Judging by the sculpt of the flaps on the pockets and the grenades sculpted on one side, the pack is meant to be worn with the bedroll hanging from the bottom; however, due to the hood on the parka, the pack fits best on the figure with the bedroll on the top. Whoops. Despite that, "Arctic Trooper" Snake-Eyes is an excellent new variation on the old favorite, and a good toy in his own right. This isn't some cheap costume dreamed up to sell toys, this is a variation that makes sense: it's straight from the comics, and was driven by story rather than marketing. The sculpt is good, and it's really unexpected to get an entirely new body mold on a Snake-Eyes figure. This is unlike any other Snake-Eyes you have, so you don't need to worry about this being a duplicate in your collection.